"Smoky and sweet with a hint of heat to add a twist to a classic grilled cheese sandwich with roasted raspberry chipotle sauce." Butter 4 slices of bread with a tablespoon of butter each. Place 2 slices butter side down onto skillet. Place 2 slices of cheese on each. 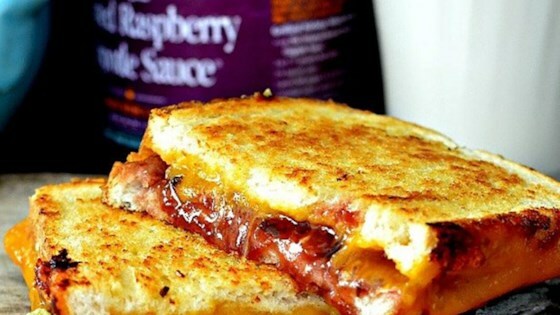 Spread 2 tablespoons of the roasted raspberry chipotle sauce onto each sandwich, and top each with 2 more slices of cheese. Top each with remaining bread, butter side up. Grill until bottom is lightly browned; flip sandwiches over. Grill other side until browned and cheese has melted. For a kid friendly version use white or wheat bread and their favorite jelly in place of the raspberry chipotle sauce.